Charlie Bennett was enjoying a productive 1882 season as the primary catcher for the Detroit Wolverines (NL) when the club traveled to play a series in Worchester, Massachusetts in early August. Before arriving in Worchester, Bennett met secretly with Al Pratt of the Allegheny Base-Ball Club, members of the upstart American Association. On August 3, 1882, Bennett agreed to play for Allegheny during the 1883 season at a salary of $1700 and signed a preliminary agreement—in exchange for an additional $100—that he would execute the formal player contract shortly after the 1882 season concluded. Bennett, however, had second thoughts and refused to sign the 1883 contract with Allegheny. On November 18, 1882, Judge Marcus Acheson ruled in favor of Bennett and against the Allegheny Base-Ball Club. Unfortunately, the court made an oral ruling, so the specific reasons for the decision have been lost to history. Ultimately, the Allegheny ball club accepted the ruling, admitting afterwards that they were interested only in Bennett’s services, and not monetary damages. The American Association thereafter imposed a ban of Bennett, not that it mattered much. Charlie Bennett went on to compile his best season in 1883 for the Wolverines, posting career bests in hits (113), batting average (.305), slugging percentage (.474) and on-base plus slugging percentage (.825), and bWAR (4.9). Bennett would also be credited, along with help from his wife, of inventing the catcher’s chest protector in 1883, constructed of cork and “bedticking material” and craftily hidden under his uniform as to avoid ridicule. 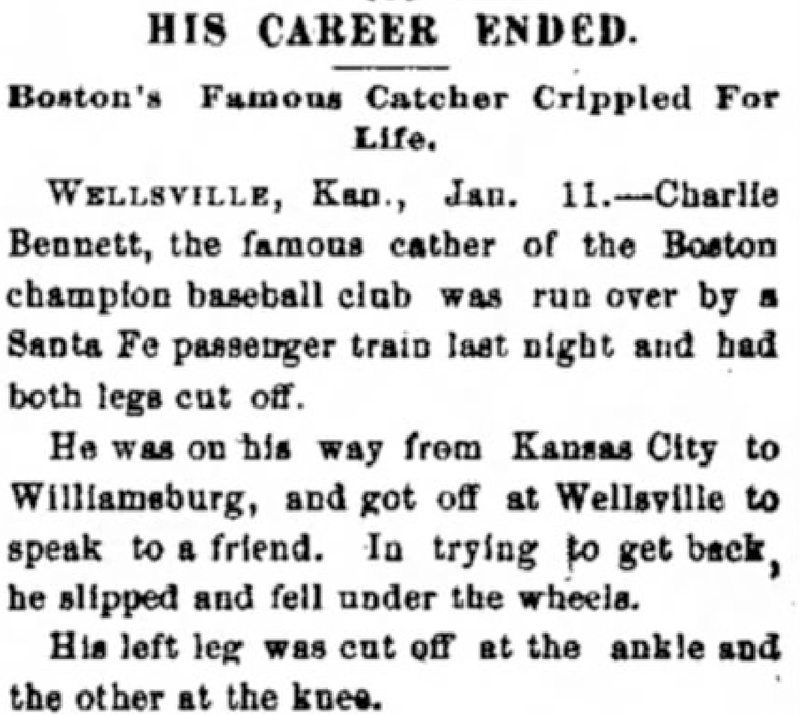 His baseball career came to an abrupt end in 1894 when he lost both of his legs in a train accident. The Daily News (New Brunskick, New Jersey), January 11, 1894, 1. The Alleghany club had made similar deals in 1882 with Chicago White Stocking’s third baseman Ned Williamson and Buffalo Ruby Legs’ pitcher James “Pud” Galvin; however, neither of these players followed through on their pledges to play for Allegheny in 1883, each returning to play the following season for their old National League clubs. In 1884, Williamson would set the single-season home run record of 27—which stood unbroken until Babe Ruth swatted 29 home runs in 1919—as the direct result of a rule change at Chicago’s home ballpark that considered hits over the outfield wall as home runs, not doubles, despite a leftfield line measuring only 180 feet. Pud Galvin, would eventually play for the Allegheny Base-Ball Club after his contract was purchased from Buffalo in July 1885. Galvin would end up winning over 300 games and was elected to the Hall of Fame in 1965. The Allegheny Ball-Club ultimately abandoned the doomed American Association for the National League in 1887. The club assumed the “Pirates” name in 1891, fully acknowledging their nefarious appetite for signing contract jumping players, like Mark Baldwin and Silver King, with the groundwork seemingly laid in their attempted inducements of Bennett, Williamson and Galvin in 1882.